Odense is the largest city on the island of Funen in Denmark. It is the third largest city in the country over all. As of 2013, the city had a population of 170,327, and the total population of the Odense Municipality was 193,641. 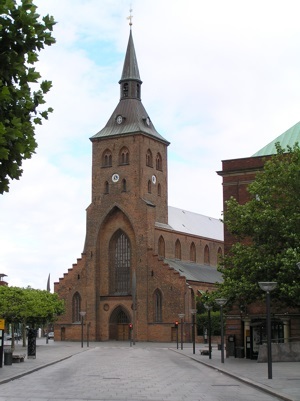 Odense is a city on the Danish island of Funen. Odense is the largest city on Funen, and the third largest city in Denmark as a whole. As of 2013, the city of Odense had a population of 170,327, and the total population of the municipality was 193,641. The name Odense derives from the god Odin of Norse mythology, and vé which means "shrine" - thus Odense means "Odin's shrine". The most famous landmark in Odense, was between 1935 and 1944, the Odinstårnet (the "Odin Tower"). When the tower was constructed in 1935, it was, at 581 feet (177 meters) tall, the second tallest tower in Europe after the Eiffel Tower. Unfortunately, it was blown-up in 1944 by a Danish Nazi group, and has never been rebuilt. Today, the most popular tourist attraction in Odense is Odense Zoo. Odense, like the rest of Denmark, has an oceanic climate, moderated by the Gulf Stream which brings warm water across the Atlantic from the Gulf of Mexico. Are you planning your next vacation abroad and you’re ready to explore? Do you want to be prepared for everything? Are you ready to experience every new place you visit just like a local? Well, with this amazing Odense (Denmark) travel map you’re all set and ready to go! The Odense (Denmark) map was carefully designed to give you amazing results and make traveling easier than ever. We make sure to constantly update our info to give you the most relevant and accurate information, so you will never get confused or frustrated during your Odense (Denmark) trip. The map is very detailed and it will not only give you all the available roads and routes, but also the essential information to make your Odense (Denmark) vacation unforgettable. In the Odense (Denmark) map you will also find the best places to go shopping, the most famous and must-see sights, churches and more. Whether you live, study or simply travel abroad, our Odense Vacation Journal is the most exciting and eye-catching way to keep all your travel plans and memories in one place! We carefully marked all the restaurants, bars and pubs so you can always find one that is nearby. In the Odense (Denmark) map you will also find the best places to go shopping, the most famous and must-see sights, churches and more. And if an emergency comes up, there are markings of police stations and hospitals everywhere for your convenience. Presents a bouquet of shaded contour maps to suggest the broad potential of their use in population studies. Travel Journal Odense, Denmark - Keep a diary of your holiday / vacation to Odense, Denmark. Includes diary, budget planner, activity planner, packing checklist and other useful aids to help you record and remember every aspect of your trip.